Welcome to Fern Hill Golden Retrievers! We are admirers and breeders of field and working line Goldens. These are not the fluffy pale blond dogs you may have seen in the conformation/ breed ring, but are the old line red dogs bred to retrieve, with the intelligence to make you proud in any working discipline and the personality to make you fall in love forever. 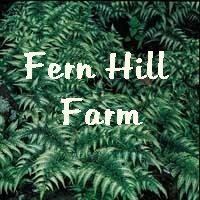 This is not to say you can't find loveable, smart, birdy and highly trainable dogs in the show lines, but here at Fern Hill, selection for those traits are at the heart of our breeding program. 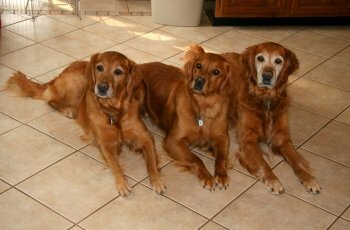 Our goal is to breed talented, personable, long-lived, conformationally correct and handsome Goldens that are first and foremost loveable companions. Our girls are from the best field / working bloodlines available, and the stud dogs we use are proven, multi-titled, versatile dogs from the top of the breeding lists. Look at the 'Puppies' tab in the menu bar above to go to our individual litter pages. Information about future litters and possibly getting one of our puppies is here. To find out more about us, press one of the links at the top of the page, or go to our Menu Page to easily find information and pictures about previous litters, our girls, general training information, and more. We are happy you stopped by and hope you visit our site again! Visit Chewy.Com for all your pet needs -- the most amazing customer service on the planet! 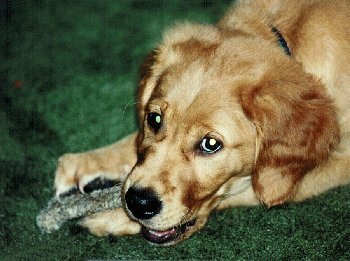 Before 1970, there were no distinctions between working and conformation line Golden Retrievers. They were essentially the same dog! In the years since, however, the breed has developed two quite distinct types. A male named Cummings' Gold-Rush Charlie came along in 1970 and became wildly successful in the conformation ring. He was like no Golden before him, with a new and very distinct look, and became very influential in the show lines. As a result of his influence, the breed ring has increasingly belonged to heavy boned dogs with longish bodies that may appear rather low to the ground, and often with a somewhat downward slope along the topline. Coats on show dogs have become longer, straighter and silkier, and the most desired color is a pale gold / cream. 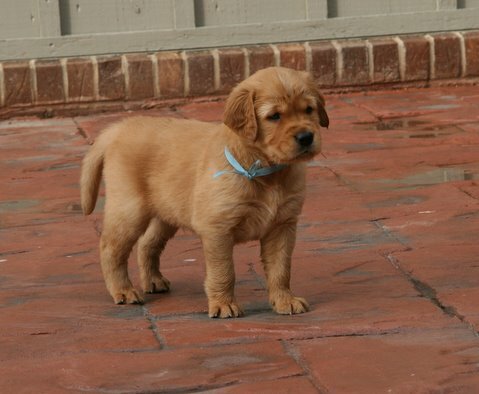 As show ring success has become more difficult to achieve with the increased number of Goldens being shown, looks have become THE most important attribute for many show-line breeders. As a result of the decreased attention to disposition and working talent, the prevalence of truly outstanding working dogs in the conformation lines has declined and timidity and nervousness has increased to some extent. There are still wonderful, all-around goldens with great working potential and outstanding dispositions available within the show lines, but by no means are these characteristics universally present. At around the same time, the field	Goldens, owing to the influence of an English import named AFC Holway Barty, diverged in another direction. 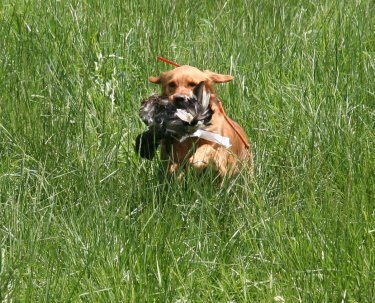 Forsaking looks as a principle target, field breeders worked hard to improve the hunting and retrieving abilities of their dogs. As a result, intelligence, trainability, the "bold golden" disposition, high activity levels, and extreme athleticism are much more prevalent in these lines as these are the features most necessary for field/working sucess. While many of these dogs have wonderful basic conformation (after all, they do have to be able to hold up physically under demanding athletic competition), some of the features such as pretty broad-muzzled heads, full dentition and good scissors bite, correctly carried tails, dark brown eye color and dark nose leather are not universally present. 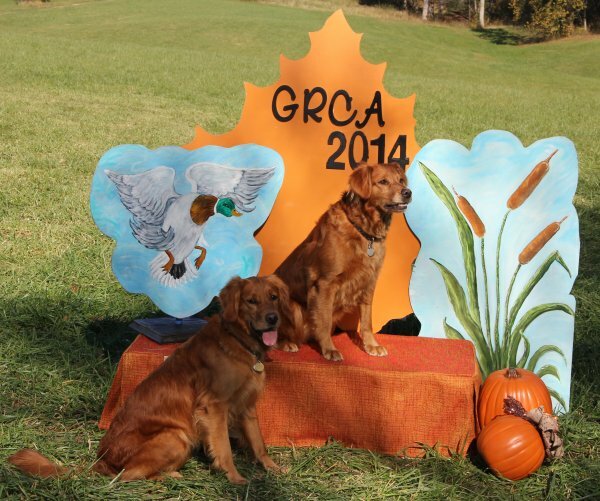 There are other differences in appearance as well  most of the field dogs are various shades of red gold, typically darker than the show goldens. They are frequently smaller, lighter boned, longer in the leg, and have shorter, curlier coats than the dogs that are currently successful in the conformation ring. White markings, highly discouraged in the show ring, are also more common in field lines.